Pour Jean Macain & Samuel Georges, marchands bourgeois de la Rochelle, demandeurs, tant à l’interinement de certaines lettres Royaux, en forme de requeste ciuile, du 21 Juin 1612 coutre deux arrests du 1 & 2 iours dudit mois de Juin audict an que de ces circonstances, & instances dépendantes à ladictte requeste ciuile par arrest contradictoire du 19 Octobre audit an 1612: Contre Pierre du Gua Sieur de Monts, Pierre Caulier & consors & Jean Ralleau, cy deuant Secretaire dudit Sieur de Monts defendeurs d’vne part, & ledit Sieur de Monts & Corneille de Belloys defendeurs d’vne autre part, & encoriceluy Sieur de Monts en diuerses instaces, defendeur d’autre. s.l., s.n. , 1612. 8 pages in 4o; 24.5 cm. While no edition number is stated, facta within the French legal system of the early 1600s would have been printed for the court, the parties involved, and their lawyers. For a complicated case with multiple appeals and lawyers as many as fifteen copies would have been printed. Only one other copy of this factum has been located and it is held at the Bibliothéque Nationale de France. 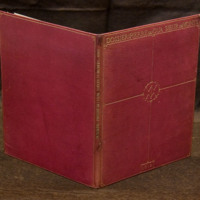 This volume is bound in full red morocco leather, with front and back covers outlined in a single gilt fillet. 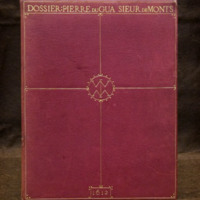 A single horizontal gilt rule 1.5 centimeters below the top rule forms an enclosed title panel, which includes in gilded, uppercase, and evenly-spaced type the abbreviated title: “DOSSIER: PIERRE DU GUA SIEUR DE MONTS.” Beneath the title panel, the front cover is divided by a compass-like design with a vertical single gilt fillet cutting down the middle and a horizontal single gilt fillet across the midsection, creating four compartments, and which feature two single gilt dots at the border intersection. Three gilt dots are located in the inner corners of the gilt frame on both front and back covers. In the centre of the front cover is the monogram “WIM,” composed of single gilt fillets and enclosed by a gilt circle comprised of evenly-spaced gilt dots along the outer edge. Centred above the bottom gilt fillet is the date of publication (1612), encased in a small box formed by single gilt fillets and a series of gilt dots. 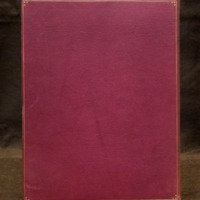 The same abbreviated title and publication date in uppercase gilt are repeated on the spine. The leather turn-ins are decorated with single gilt fillets along the inner and outer edges, with single gilt dots located at the outer corners of the turn-ins. “D.C. 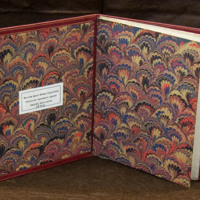 & SON 1935” is blind stamped into the lower left corner of the back cover turn-in, and the endpapers feature the distinctive Cockerell marbled paper pattern, composed of blue, red, black, and cream inks. The pleasing symmetry of the centred monogram, title and publication date within simple gilt framed boxes is very effective. The colour tones of the marbled paper endpapers match the red morocco binding perfectly. *When his business partners Jean Macain and Samuel Georges failed to deliver supplies to Acadie by a contracted date, De Monts sued. This factum is the official appeal launched by Macain and Georges.